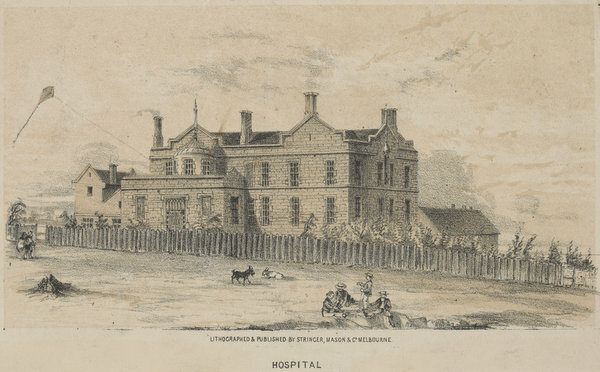 The winter of 1849 was an exciting time at the Melbourne Hospital as love blossomed between the resident apothecary and matron. In those days, anyone who could afford to would pay a doctor to visit them at home. 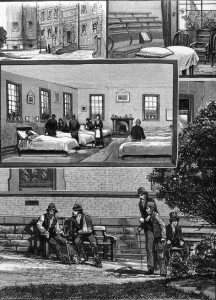 For those who could not afford this, they went to the Melbourne Hospital, which was the city’s first free hospital. Mr Joseph Clowes was already working at the hospital as the resident apothecary when, in February 1849, the widow Mrs Marion Allingham started work as the hospital’s new matron. As part of her employment, Mrs Allingham lived at the hospital. Mr Clowes obviously took an instant shine to Mrs Allingham, as in the following months he arranged to have her bedroom completely refurnished and repainted, according to their Annual Reports. The workplace romance continued through autumn and by winter, wedding bells began to ring. On Wednesday 17 July, apothecary and matron tied the knot at the Wesleyan Methodist Church, just one block east of the hospital up Lonsdale Street. Mr and Mrs Clowes worked at the hospital for another year before moving on and having two children together. The Library holds many publications by and about the Melbourne Hospital, which in 1935 became known as the The Royal Melbourne Hospital.